The connection is sporadic here at camp. So there will be few words. I’ve got wax going pretty good on 6 of the 12×12″ panels now. It’s hard to type sitting in the SUV out in front of the dining hall with the laptop on my knee. (not much of a typist anyway.) I think this is going to be a good medium for my purposes but there is a learning curve for just about everything I’m used to doing. Here’s the image of the first one….I started it at home the day before I came and finished it yesterday. More later…happy hour and dinner is calling. Jumping in off the deep end! Jumping in off the deep end! Time for my Mississippi Art Colony retreat again. I leave early in the morning for about a 4 1/2- 5 hour drive to the camp near Utica, MS. There will be no “comfortable” work to fall back on at this colony. I’m leaving all my canvases and acrylics at home. I’m only taking the encaustic waxes, and oils since you can extend colors with oil when you want/need to. I’m taking the 12 x 12″ Ampersand panels to work on and a few pieces of watercolor paper to prepare for oils if I get the notion to work with “just paint”. However, that won’t be as usual either since these oils paints are OLD and I have not used them much at all in 20 years. One of the reasons I use acrylic is because I need to layer and layering in oils is a long time process. Heck, while they dry, I forget where I was going. I am taking some collage papers as that was one of the two main reasons for wanting to try this medium. You can just embed them in the wax……the other reason, of course, is the wonderful, sensuous surface of the wax. Quality of surface is one of my real loves in painting. I won’t even be able to work in my same spot at the camp either. Since I’m using the waxes I need to be outside to keep the fumes at bay. 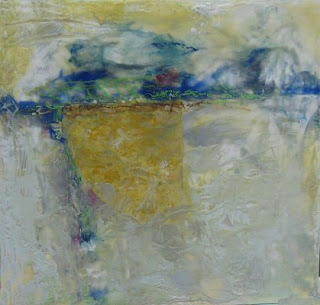 I should be able to pick up a few tips here and there as several colony people use encaustic. Heaven knows I need tips. This is a good time for this since I don’t have any obligations to fulfill right now. I need to do something different, experiment a little, get out of my comfort zone………and now I’ll have 4 straight days with nothing else to do but paint and get together with good art buddies. Overall…………a good day Saturday! After getting up at 5 am and going over to pick up a friend, we drove to Dallas for an art seminar and DADA art walk. …hum maybe drive in Dallas is a better word. We found the Latino Cultural Center without any problem at all, registered and waited for the seminar to begin. (while looking for the previous link, I found this one that really shows off the building outside…at the Dallas Arts Revue site… All the fees went to a good cause (scholarship for an art student). The seminar was a mixed bag…I didn’t get much from it personally as an artist. I know they were trying but some of the hierarchy in the art world just don’t “get it” as far as the perspective of the average (is there such) artist working out there today. Most of them think we’re all trying to beat down their doors to show our work and that we don’t have an inkling of what they do and how they schedule. Only thing is, we do…or I say WE…..I do and so does the artist in the audience who asked the question that I can’t remember exactly now. He wanted to know how we could better facilitate networking and more interaction among all the different levels/strata (museum administrator/curator, gallery dealer,critic, artist) or whatever in the art world there in Dallas and north TX. (This was my take on the question anyway). Shame on me for being shy about speaking out so I respect that he did so. Anyway, the curator/museum administration/critic types who were there on the panel….just didn’t GET the question. There would be none of any of it without the artist. Hence the problem. Now, my take on this is that we all need to be out there networking our rears off ALL the time….but how do we do this and also have the private, introspective time we need to create our work? You just can’t do it all. In a perfect world, someone would be there to do some of this stuff….and some artists think they need to find someone to SELL them or do it for them. It just is not gonna happen people. You have to do it yourself. The internet is certainly a boon to the artist trying to do as much as they can in whatever time they have to spare. It has been for me anyway. Hum……..sorry about that! I got off on this tangent and forgot about what a great day I had running around to a few galleries, visiting with my own gallery, Norwood-Flynn Gallery, have a great dinner with friends and daughter…………but a long day that ended past midnight. NOTE:….when I really want to look at the art, I’ll have to go back and take more time to see less….no way can you really look during an art walk as much fun as it is. On the rest of the good for the day…………an email when I got home that a painting at Joyous Lake Gallery had sold within 24 hours of being hung. Thanks to Gwen for inviting me to show at her gallery in Pinetop. There’s something to be said for positive thinking. I’m ordinarily a positive person and look for the bright side of just about anything. That said, I gotta say, something wonderful must be going to happen for me to make up for the big mess I’m making with these encaustic paints. You should see the effect I’m getting….not gorgeous I can tell you. It might look a little like marbleizing. Hum…the beeswax smells good though. Nowhere did I see anything in my researching about how to lay down a nice thin even coat of wax. Maybe that’s the problem…so to heck with it. I just decided to keep adding a little more and a little more. My first idea was to melt plain wax on the hot palette and just dip the front of the panel in it and smooth it out. Needless to say, that didn’t work as planned. It might be a good plan but maybe I got in a hurry and the wax wasn’t fluid enough all over the palette yet. Then I got out some old oil paint sticks and made some marks. Now wonder why that old oil stick looked like black but was really dark blue! On top of the unbleached beeswax it looks like the color pineapple yellow and blue. This will take a little (did I say little??) getting used to.Wax either dries before you can get it from the hot palette to the panel or turns into marbelizing when you heat it up with the little iron or hot gun. I may have to paint with the hot gun in one hand and the brush of wax pigment in the other. Maybe you’re supposed to scrape it all down as you apply it to smooth it out? I don’t know but it’s a work in progress, that’s for sure. Oh yeah….I think I’ll title the diptych………The Red Thread. Title compliments of a suggestion from my friend, Margot Comstock. Busy morning around here….but the new diptych is finished, photographed (with slides) and a trip to FedEx made to ship a different painting to my friend Gwen Pentecost in Pinetop, AZ. Gwen has graciously extended an invitation to me to show some of my Little Pieces of Land series in a show there at Joyous Lake Gallery in August. Back to the diptych……….I went back to work on it not knowing if it would take a few strokes of paint or a lot. If you’ve ever worked with acrylic you know how it dries darker than it looks when you are in the process of painting it. It can look just gorgeous and then you go back the next morning and it’s deader than a doornail.So you have to work all over the painting just about every time you pick up the brush. Sometimes, like this time, I’m fortunate that I didn’t have to do that. This painting ended up not taking that much more work and the colors seemed to all come together….it’s a moody painting so I decided extending the value range was not something I wanted to do. 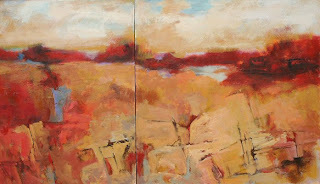 It’s title is still “new diptych”….any good ideas out there for a title??? Still gotta go put more paint on the sides and keep myself from adding more anywhere else (you know artists)………varnish and put hangers on…then they can go to the corner of the storage so I can get to work on something else.